I was productive in 2018. I am happy to finish the year with satisfaction. I was productive this year. I spoke in conferences, corporate events, churches, and colleges. I read 12 books. I coded daily for more than 100 days, during which time I developed 4 products. I traveled with family to Sri Lanka, Dehradun, Wagah Border, Amritsar, Dharamshala, and Hyderabad. I started to exercise in the latter half of the year and lost little more than 5 kgs. I am happy to finish the year with satisfaction. We started the year with travel to the exotic Sri Lanka. We went as a family. We visited Dambulla, Nuwara Eliya, Yala, Hikkaduwa, and Colombo. The country is so beautiful. Visiting the Yala national park and swimming in the Hikkaduwa sea were the two unforgettable memories of the trip. We traveled to Dehradun on a one-day trip. We spent every hour in Dehradun at Kempty falls. Soaking in Kempty falls was an amazing experience. Later in October, we traveled again. This time we traveled to Wagah border and witnessed the aggressive flag march between soldiers of Pakistan and India. Walking up to Bhagsunag waterfall in Dharamshala was another amazing experience of this year. In November, we traveled to Hyderabad. I like historical art and my younger son is obsessed with cars. Hyderabad became a treat to both of us. Salar Jung Museum is an exception to Indian museums. To start with, it is huge. It is so huge that it is one of the largest museums in the world. We spent half day touring the museum. We had to skip few sections since kids started to become tired. If I had gone alone, probably I would have spent a day. Then it is not filled with just one type of artifact. There are war attires, guns, swords, walking sticks, crucifixes, sculptures, manuscripts, and ceramics. Not just from one country. Japan, Egypt, Italy, India all find a place in the museum. The best artifact is the Veiled Rebecca. I couldn’t believe a transparent veil could be sculpted. Why this sculpture is not as famous as Mona Lisa, is something I don’t understand. If Salar Jung satisfied my appetite, my son got a treat from another type of museums. Sudha Car Museum is an off-the-beaten, nevertheless an interesting spot. The owner Sudhakar has built cars resembling everyday objects like handbags, cricket bat, and helmet. My 6-year old had fun looking at each “car”. There is also vintage car museum in Chowmahalla Palace. He now wants to move to Hyderabad! Like any introvert, I don’t enjoy public speaking. Few years back, I became a CTO and public speaking came along with the job. Instead of shying away, I embraced every opportunity to master the art of public speaking. This year provided so many opportunities. First came Chandigarh Azure global Bootcamp. I delivered a keynote titled, “How to deliver value in digital age?”. Then came Agile Chandigarh event. 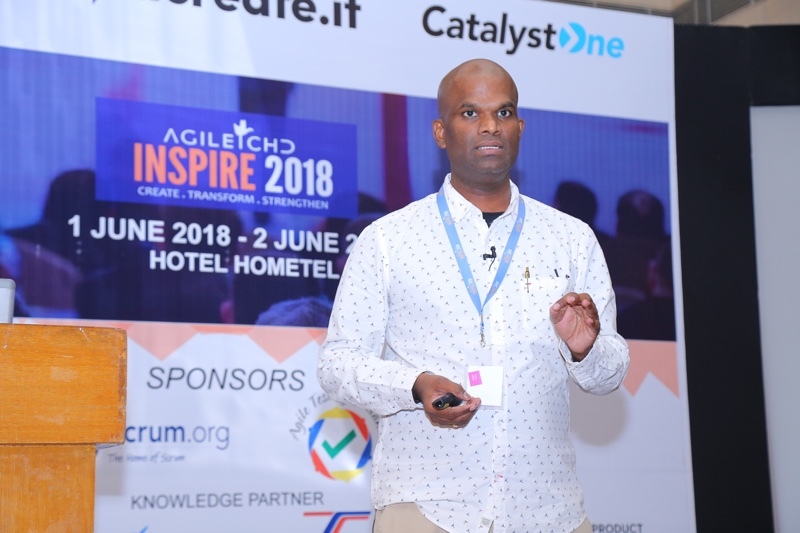 I delivered a talk titled, “Agile in the C-Suite”. These two were the larger events. But I also spoke at mini-events. I also spoke in churches. I led Bible Study in my church on Abraham, Nehemiah, and the book of Ephesians. In another church, I spoke on the topic Walking as kings because of Christ. Speaking in such diverse topics and stages gave me a grip on public speaking. I prepared a lot. For every talk, I took notes and rehearsed. Such preparation increased my confidence. I didn’t squeak in any of these talks. It has been more than a decade since I coded for work. I believe in practical knowledge rather than theoretical knowledge. So I challenged myself to code again. Since June, I have been coding almost daily. There are times I would break the chain because of family duties and travel. I got back to the rhythm as soon as I can. I learned Golang and Vue. I developed 3 products mainly satisfying my own needs. First one is Sheet2Buffer. I created it to send social media updates to buffer tool via Google Sheet. Second one is EveryPaisa. It is a tool to track income and expense. Last one is an online video course tool. I plan to launch few course in the next year as part of Prudent Devs site. You can already use Sheet2Buffer and EveryPaisa. Use them and let me know your feedback via twitter. I wrote 25 blog posts between this site and at Prudent Devs. Around the same time that I starting coding daily, I started to exercise. I wanted to work-out from home rather than joining a gym. So I started with what I knew — rope skipping. For a long time, that was all that I did. Then, I added other exercises one by one. Now-a-days I do plank, reverse crunch, squat, push-ups, and leg-raise. Exercising isn’t without pain. But it comes with its own gain. I lost little more than 5 kilos, I feel good, and I have a better posture. Exercising is a mental game than a physical one. When the time comes for work-out, I hear all negative voices — “just skip this one day”, “it hurts from yesterday’s session; should you do it today too?”, “may be just do little bit”, and so on. I have to keep that voice in check every time. I have learned to deal with that negative voice by focusing on the task at hand. At 7.30, I focus on wearing the shoe. When I exercise, I focus only on the one I am doing at that moment. With that kind of mind-control, I surprised myself with 80 push-ups one day. It is all in the mind. I read a lot and stored the best ones in Evernote. I am listing only two here that had profound impact on me, to the level of changing how I thought about a subject. This year I worked among daily laborers. I visited their homes, shared meals with them, listened to their dreams and struggles, and encouraged them in the ways that I know. I grasped what Goins wrote. The poor don’t want handouts. They want hope. They want hope that if they work hard they can come up in life. They want hope that they will not be discriminated because of caste, creed or color. They want hope that their children can out-shine them. Poverty is not about economics. It is about hope. There is a strong relation between product, design, and technology. Product + Design without Technology is Vaporware. We have a great idea and people seem to want it. But we can’t build it. Design + Technology without Product is a Hackathon Project. It looks great and it’s even fully functional, but there’s no market for it. Product + Technology without Design is an Office Printer. The necessary evils of the world that are completely at risk of being disrupted by a customer-centric innovation. Alternatively, when there is a balance between all three disciplines, that’s when you get amazing stories of success. I read 9 books and listened to 3 books, all on Scribd. I could take notes on books, but not on audio-books. The Cluetrain Manifesto by David Weinberger, Doc Searls, Christopher Locke, Rick Levine. “Markets are conversations” and “Hyperlinks subvert authority” are still true as much as it was true when these theses came out, in 1999 . CEOs who understand the impact of these alter their business models. Employees who understand these, build better career. Thou shall prosper by Rabbi Daniel Lapin. Rabbi Daniel distills the Jewish business wisdom into 10 commandments. In one of the chapters, he lists 4 factors that are required for a holistic success in life — wisdom, network, wealth, and autonomy. I have tried to improve on all these factors this year. I had sufficient success in all factors except wealth. Hopefully in the coming years I taste some success in that too. Christianity offers both long-term and short-term benefits; (eternal life + rewards in this life). This is an attractive combination. When Rome had plagues, Christians cared for the sick, while others threw the sick in dungeons. This did 2 things: Christians outlived the pagans; Surviving pagans embraced Christianity. Christians accepted women and didn’t discard female infants. Like mercy in times of plague, this caused Christian numbers to swell. There are thresholds, doors of opportunity, around you, all the time. Most of them are invisible to you, because you are focusing on other things. But they are there and they offer incredible potent. A belief is something you hold in your mind, a kind of map or model of that external reality. But just as maps and models can be wrong, so can beliefs. Beliefs are not reality. They are not facts. They are constructions. Liminal thinking is the art of creating change by reframing beliefs. Making Great Decisions: For a Life Without Limits by TD Jakes. Bishop Jakes focuses more on relationship decisions than on life’s decisions in general. One key point I learned from this book is this: Successful people often envision themselves going through the intricate motions of their most exceptional performance. I used to envision the outcomes, but what Jakes makes sense. You should envision the performance itself and not the outcome. The giants you face define your identity. The greatest threat to your destiny is not the giant in your life but your own apathy. The soldiers who lived in fear of Goliath were convinced that the image in front of them was the only possible reality. Yet David saw the same image and overcame it rather than shrinking back in passivity. You are constantly morphing either into what God has intended or what the enemy of your soul intends. Reframing does not mean denial, but discovering the future God wants. Psychology of Selling by Brian Tracy. If you are planning to get into sales, this is good introductory book. Brain Tracy defines seven key result areas for sales and explains each of these areas in detail. Throughout the book, he emphasizes developing a positive self-concept. Everyday is full of opportunities. If you have positive self-concept, then you will grab them and succeed. If you have negative self-concept, then you will be scared, anxious, and most-likely fail. 90 Minutes in Heaven: A True Story of Death & Life by Don Piper with Cecil Murphy. Shane Parrish mentioned this book in twitter as one of the books that stayed in the NYT best-selling books list for 163 weeks. It is a true life-story of a pastor who died in a car accident (emergency medical technicians recorded that he had no pulse) but came back to life because another pastor crawled into his damaged car and prayed. Within that time he claims he went to heaven. In the latter part of the book he describes his recovery and how people helped him recover. It is an amazing story of prayer, advice, and personal growth. Whisky in a Teacup by Reese Witherspoon: I loved Reese in the movie, “Sweet home Alabama”. So when this book turned up on my playlist, I gladly read it, though most of the content is not useful to me in any direct manner. Audacity of Hope by Barack Obama. Case for Faith by Lee Strobel. To Sell Is Human: The Surprising Truth About Moving Others by Daniel Pink. All Saints: A new salesman-turned-pastor is sent to an almost bankrupt church to sell it. While he is preparing the church for sale, refugees from Burma arrive there seeking help. The pastor has a change of heart. He now wants to help the refugees and re-build the dwindling church. This is a true-story and shot on actual premises with some of the original congregation. It is a fantastic lesson on building a tribe, going forward in the midst of self-doubt, and accomplishing what one sets to achieve, through many setbacks and change of paths. I have read and heard that quitting social media improves productivity. I didn’t believe it. This year, I deactivated my Facebook account. When I was active on Facebook, my mind would be occupied with something someone said in it. Even if I wouldn’t reply back, it would occupy my mind for long. When I deactivated Facebook account, that amount of mind-power was available for other activities. I followed it up with deleting the Twitter app from my mobile. I still used Twitter but only from laptop. As an young Christian, I admired St. Paul. Unlike the modern preachers, who always seem to scream “give me your money”, he supported himself by tent-making. He worked to make enough income so he can pursue his passion. Years later, I read Anti-fragile by Nassim Taleb. Taleb talks about barbell strategy to build an anti-fragile life. He suggests to have a secure job on one end. On the other end, you follow your passion, like writing. This year I was able to do what the saint and the philosopher taught. I have a job where I work for three days a week. I work intensively those days. Other days, I pursue my passion — writing, reading, coding, and preaching. I was inspired by the saint and the philosopher. I didn’t know how to turn that inspiration into reality. There was no elaborate strategy or a “7-step plan”. It just happened. Guess, I’m just lucky. That’s why I will fondly remember 2018 for long.